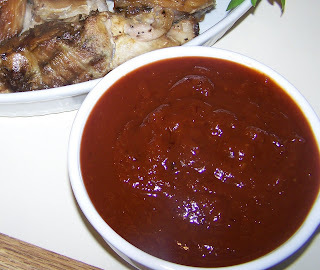 At the recent BBQ Society - Mayhem in May BBQ Fanatics performed well in the Sauces section. There were a few requests for the recipe, so here is it is. It does take some time, but I have found that if you are prepared to bottle it, it will last 3-6months in the fridge. 1.) Take 1/2 the onions and fry in a little oil till translucent. Add the chilli, garlic and ginger and fry for an additional 5 minutes. Take the entire mixture and put it in the blender with a little water(using the water user to re-hydrate the chipotle's). You are looking for a paste consistency. 2.) Take the rest of the ingredients (excluding the vinegar) and put into a pot, bring the entire mixture up to the boil and, then let it simmer for 20 mins. 4.) Bring off the heat and put the sauce into the blender. Blend the results till nice and smooth.